"If something is not done then he will likely slip further and further into mental decline." 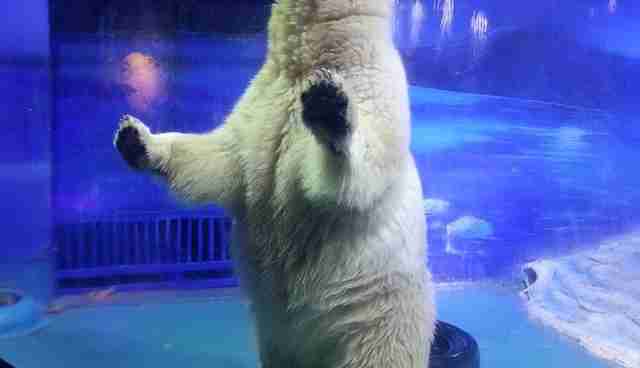 The world's saddest polar bear still hasn't tasted freedom. Pizza the polar bear first came to the world's attention back in January, when China's Grandview Aquarium opened its doors. 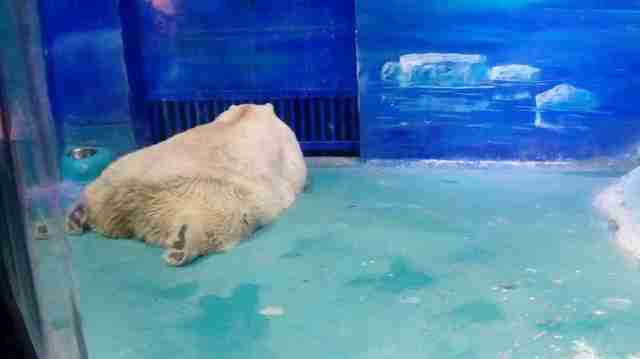 The shoddy zoo, which houses 500 species inside a shopping mall, keeps the polar bear inside a stark concrete room painted a garish shade of blue. Pizza never sees the sun or smells fresh air, and he's surrounded all day by tourists and camera flashes. It's unclear if he has any other bears to interact with. And now, he might be going crazy. Recent footage shows the bear displaying clear signs of stereotypic behavior - mindless, repetitive patterns animals develop to cope with the psychological stress of captivity. In one clip, he can be seen pacing back and forth before the window of his tiny room, swinging his head almost violently with each turn. In another, he lies on the floor facing the wall, mouthing obsessively at a grate. 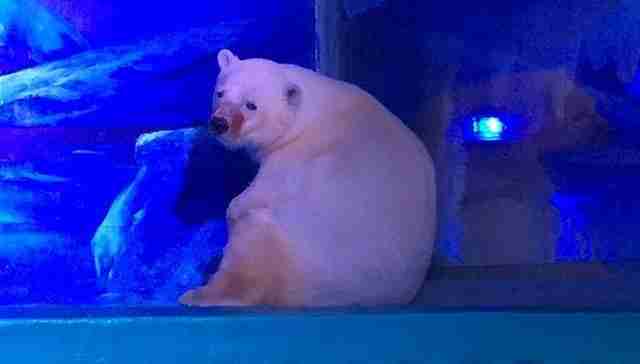 "This polar bear is showing classic stereotypical behaviour, including head swaying and repetitive pacing, induced by frustration and poor welfare," Alastair Macmillan, a veterinary adviser for Humane Society International (HSI), which released the footage, said in a statement. "This is the animal's attempts to cope with stressful, aversive situations such as barren enclosures, boredom and constant disturbance by visitors." "The conditions in which he is being kept are completely unsuitable, vastly removed from anything approaching his natural habitat, and if something is not done then he will likely slip further and further into mental decline," Macmillan added. While an outraged public and several prominent welfare groups have been campaigning for months to pressure Grandview into freeing Pizza - more than one million people cumulatively have signed petitions against Grandview - the aquarium has yet to formally respond. 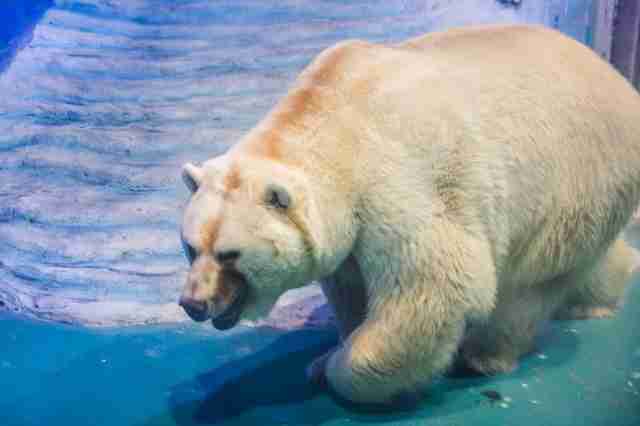 This summer, Grandview met with representatives from Animals Asia to discuss improvement to the animals' welfare, though the the aquarium made no indication that it was reconsidering keeping the bear. More recently, Yorkshire Wildlife Park, a facility in Doncaster, England, offered a new home to Pizza in September if Grandview would agree to give him up. However, the aquarium and authorities are believed to have refused the offer, stating that Pizza would not be allowed to leave the country. But now, dozens of new welfare groups from inside China are adding their voices to the chorus. On Tuesday, HSI announced an open letter signed by 50 Chinese animal groups calling on Zhu Xiaodan, the governor of Guangzhou, the province where Grandview is located, to help close the aquarium. The signatories are also asking that the hundreds of other animals at Grandview - including belugas, walruses and Arctic foxes, all of whom are held in similarly poor conditions - be released to sanctuaries or better facilities. 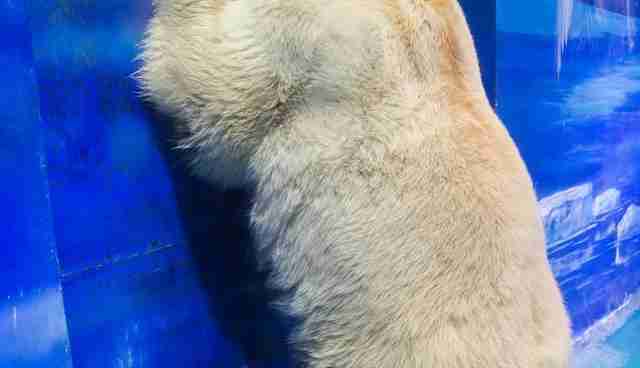 "The appallingly inadequate way that this polar bear is being kept at the Grandview is a shameful stain on China that must be swiftly corrected," Mdm Qn, of China's Capital Animal Welfare Association, said in a statement. "A shopping centre is no place to be keeping any wild animal ... If it has been decided that he will not leave China, then let's find him the best new home inside China, but we cannot stand idly by and let this once magnificent bear languish in this depressing state." "We too care passionately about these animals and want to give them a better life," Hongmei Yu, president of China's Vshine Animal Protection Association, said in a statement. "There are no more excuses left for not taking action." Yu noted that while Pizza's plight has attracted worldwide attention, his story points to a much bigger picture - that of the thousands of other animals like him who are kept in similar conditions across China. "There is a worrying trend in China of wild animal exhibits in shopping centres, with another one reportedly being considered right now in Shijiazhuang, Hebei," Yu said. "It shows a complete lack of regard for their welfare." But for now, activists are hoping that, by keeping the international community focused on Pizza's plight, they'll finally be able to give him what he's been missing for so long: the chance to be a bear. "Pizza can never be released to the wild," Qn said, as he was likely bred in captivity and never learned how to survive in the wild. "But at the very least mall operators should let him live out the rest of his days in a facility where he can breathe fresh air and see the sunlight." If you'd like to help with the rescue efforts, you can donate to HSI or Animals Asia, both of which are working to help Pizza. You can also add your name to petitions calling for his release here, here and here.